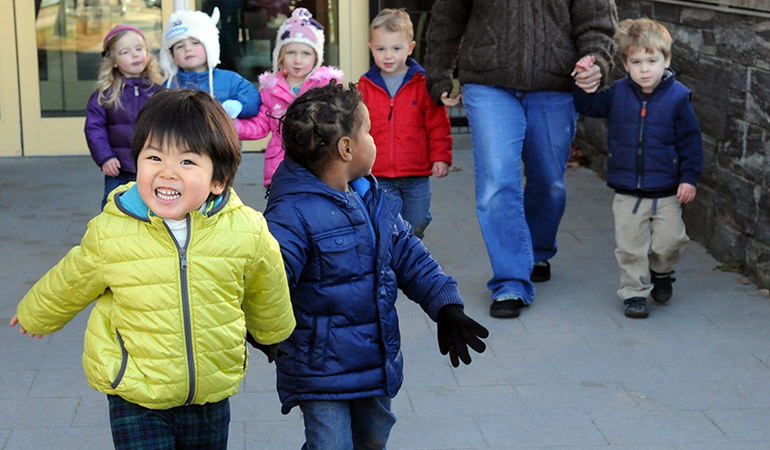 Current research on the economic impact of child care in New Hampshire shows that for every dollar spent, quality early learning yields $17 to our state, increases tax revenues, and lowers costs for special education, welfare, and crime. This comes as no surprise to us, as we have seen thousands of children graduate from our program who go on to become happy, healthy, and contributing members of our community. We work closely with the Department of Health and Human Services; the Division of Children, Youth, and Families; Child and Family Services; and the City of Portsmouth Social Services and Community Development Departments to accept referrals and provide financial assistance and support for families in need. We are also a United Way partner and organize an “Adopt a Family” Holiday Drive for approximately 20 families each year. Additionally, privately funded SELF scholarships, and emergency scholarships—made possible by the generosity of our donors—allow us to assist families who might otherwise not be able to afford quality education for their children during this crucial time of development and learning. Please give today to ensure a quality education for ALL children in the Seacoast! Annual gifts help us support scholarship programs to boost access to quality Early Learning for all families. Annual gifts also support operating costs for Early Childhood Education and Before & After School programs for items such as food expenses, classroom supplies, equipment, professional development, and more. Provide ongoing support with a monthly or quarterly gift. Make a donation that is in honor or in memory of an individual. We can send a card with your specific instructions if requested. You can make a one-time payment or provide ongoing support through a monthly gift. Our private scholarship pool provides families in need with scholarships for their child's early learning and care. We award up to $5,000 to families through SELF Scholarships each year. Note: You should always consult with your financial advisor before initiating a charitable gift arrangement. A gift of appreciated securities offers tax advantages to you, while supporting our mission. These include stocks, bonds, or mutual fund shares. The full market value is recognized for gift purposes and potential capital gains taxes are avoided. To give a gift of stock, please call our Development Director at 603-422-8223. Remember Seacoast Community School in your estate planning. Do you need to preserve your assets during your lifetime? You can plan a gift to us that will only take effect after your other obligations have ceased. To include our school in your will or estate plans, call our Development Director at 603-422-8223. Our events are great opportunities to get involved and support our mission of providing quality early learning. Every sponsorship includes significant recognition for your business via local media, radio interviews, website, e-blasts, Facebook, and Twitter advertising. To learn more about sponsorship opportunities, check out our Events page. Quarterly Newsletter: Promote your company to over 250 families and 1000 friends. Children's Art Show and Auction: This fun event, held in the spring, is a highlight for family, children, and staff and its silent auction benefits each individual classroom or program location. Sunset Over Portsmouth: A live and silent auction taking place each June, featuring food, music, wine and beer tastings, which benefits all of our programs. Memorial Bridge Road Race: A popular 5K event held on Columbus Day Weekend in partnership with Prescott Park Arts Festival! Part of the Portsmouth Chamber of Commerce RunPortsmouth Series, this race benefits all of our programs. We value in-kind donations for our classrooms, playgrounds, kitchen, and laundry rooms. All in-kind donations are tax deductible and can be designated for a program or site of your choice. To find out how to make an in-kind donation, please contact us at: 603-422-8223. Visit our WISH LIST (PDF) here.